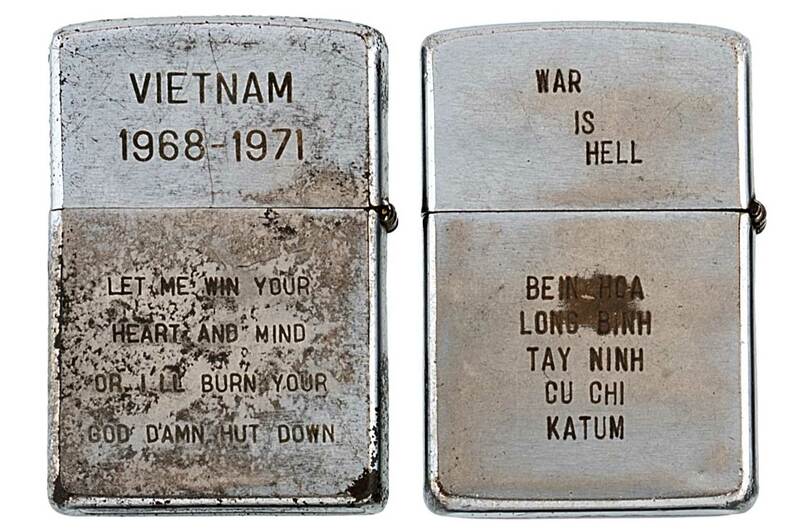 The lighters tell a story of the war that cannot be found anywhere else. They are a record soldiers’ feelings not meant for anyone but themselves, printed on a throwaway tool, capturing the spirit of the war in a way more authentic than any film, more personal than any history book, and more representative than any single soldier’s account. If you follow my other blog MILcentric you’ll have seen this content already. I won’t be sharing material often between them, except when there’s something exceptional I think both crowds will enjoy. Link to the auction and more pics at the post on MILcentric. If you are into military inspired items (mostly clothing and accessories), and can stomach my relentless posts about camouflage then I urge you add MILcentric to your daily visits. “Throwaway tool”? Come on these are Zippos not Bics. Really cool though. There are some great slogans in there. Yeah, i didn’t get the throwaway tool neither. I have had my zippo for over 7 years now, same one, being a smoker I carry it and use it everyday. Been with me on countless camping trips and still lights on the first try provided it has lighter fuel. Or anything that will burn really… I have run diesel fuel, gas, kerosine you name it. One time on a camping trip I forgot to fill it up, and still was able to light a fire, by using some very very dry moss and a sparks from my zippo! I would buy that lot in a hearbit, probably would pay more, provided i could afford to dump 30g’s on it LOL. I agree these are awesome.